In May of 2015, I dislocated my middle finger on my right hand doing Brazilian Jiu Jitsu. I had previously jammed and injured the finger multiple times, but in this instance, I had a total finger dislocation. I subsequently went on to injure the same finger multiple times over following 8-12 months. Despite acute efforts to heal the finger, I was unable to keep it from continuing to dislocate. 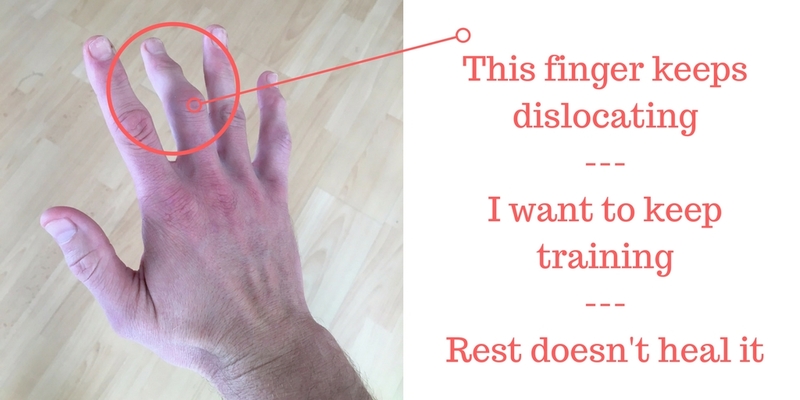 Below is my experience with physicians on the subject, how I was able to treat the finger, and my strategy for training through the injury. Additionally, I describe a little bit more about the nature of my particular injury. As I mentioned before, I had previously injured this finger without dislocating it. 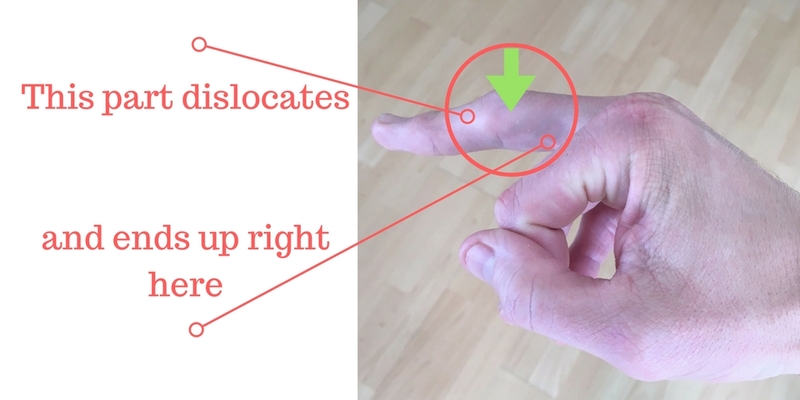 The first dislocation actually occurred when a grip was stripped from my hand during a training drill at jiu jitsu practice. The finger dislocated with the top part of my finger descending below the trunk of my finger; right at the knuckle. This usually saw the part of my finger above my knuckle nestled neatly at the top of my hand, below the remaining part of my finger. Gross, I know. This injury happened 8-12 more times after the initial injury until I was able to effectively treat and train through the injury. Mild – After several weeks it should be back to normal with little chance it reoccurs. Serious – The finger is badly damaged and must be rehabbed and rested. If it is not done properly, it is possible the injury could reoccur. Severe – The finger likely has structural or ligament damage and will need surgery to repair completely; although complete recovery is unlikely. The initial advice I received from an athletic trainer was to rest the finger and immobilize it. I did so by using a common finger splint (shown below). Unfortunately, my active lifestyle, training, and lack of true rest of the joint led to repeated dislocations and injuries to the finger. Ultimately, I had consulted enough online forums and general practitioners to know that I was probably in the rare camp where my finger dislocation would require a physical intervention to return it to its former glory. So… I went to see a hand specialist for a final opinion. The hand specialist said that it was possible my dislocation could have been connected with previous injuries. He said it was almost a certainty that I had experienced major ligament damage – if not from the first dislocation, definitely from the subsequent ones. Unfortunately for me, because of my lack of proactiveness, my options were pretty limited for treatment. Had I pursued surgical intervention quickly, it’s possible they could have stitched and repaired my finger successfully (with little hindrance to normal functions). However, it was likely that now my ligaments had shrunk or disappeared; meaning that screws and less precise procedures would be needed for any current surgical intervention. It was my hand doctors opinion that my finger would likely never be the same and that the surgery with the screws would likely mean a major drop in functionality of the finger. He felt that due to the rigors of my training, that I may be better suited for finding ways to prevent the dislocation than having a surgery that could cause me to have a drop in function. If I was to offer advice to others in this situation it would be: if you have a finger dislocation see a specialist early, if you don’t, it’s very likely you could end up with a trigger finger or a lifetime of dislocations. If it’s too late for that, here’s how I handled this situation for myself. Quick caveat: I do jiu jitsu and am very serious about my training. Also, I am used to pushing my body’s limits (I’ve trained through torn ACL’s, broken bones, and other significant injuries), so my approaches may not be appropriate for many. However, I have found it effective in preventing my finger from dislocating again. After a fair amount of rest, I learned that most daily activities would not bother the finger. My doctor told me that this was because of some of the scar tissue that built up. He also recommended these rehab exercises. After rehab, and months without incidents, my finger returned to approximately 90% of its normal function. Unfortunately, jiu jitsu and weight training posed a threat to its stability. To prevent further injury during these activities, I elected to tape my finger so that it remained in a hook fashion. In doing this, I would lose a significant amount of function but was able to fully protect my fragile finger from further injury. When I taped my finger in any other way, I experienced the dislocation again. The hook method of taping was the only way to prevent this for me. It was critical for me to ensure that the tip of my finger had very little mobility. The greatest risk for further dislocation seemed to come when grabbing or pulling when the tip was able to extend away from the base of the finger. I used common athletic tape available at Walgreens or CVS, but eventually started using pre-cut tape (available online); as I liked using strips approximately 1/4 or 1/2 inch wide. For me, I had a rare severe injury that was not originally rested with proper care. This gave me very limited final treatment options. However, I have returned to full day to day activities and have been able to prevent additional finger dislocations with careful rehabilitation and by using the taping method listed above during risky activities. 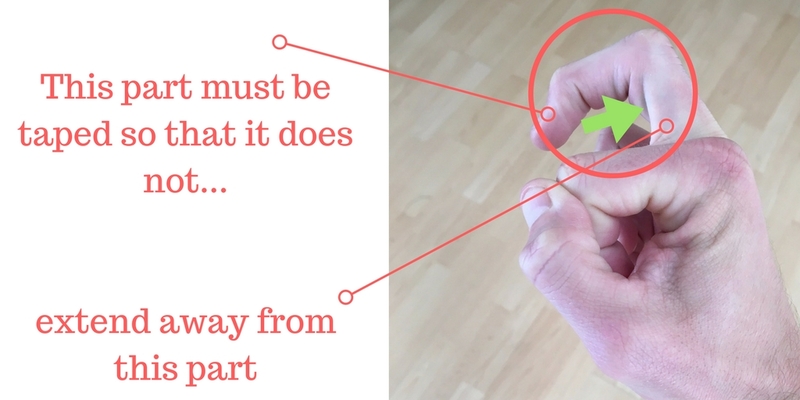 What has your experience been with finger injuries like this? Share below so others can learn from your experiences. am a year removed from surgery.